Crowd gathered at Flintstone Park in Oak Harbor to view the king tide. 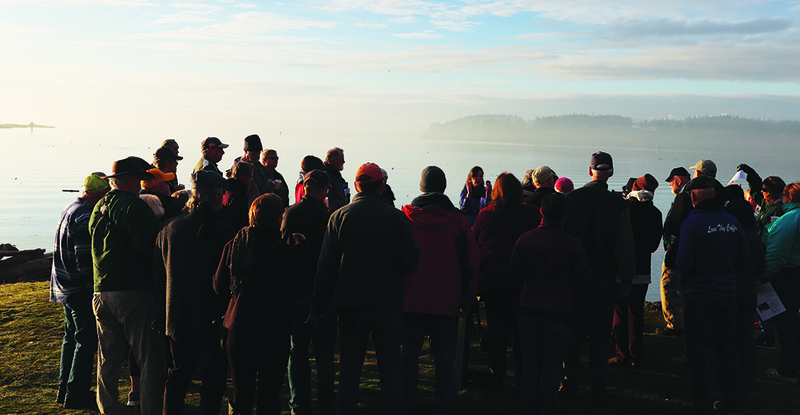 Bright and early on the morning of January 25, a gathering of about thirty people met at Flintstone Park in Oak Harbor. 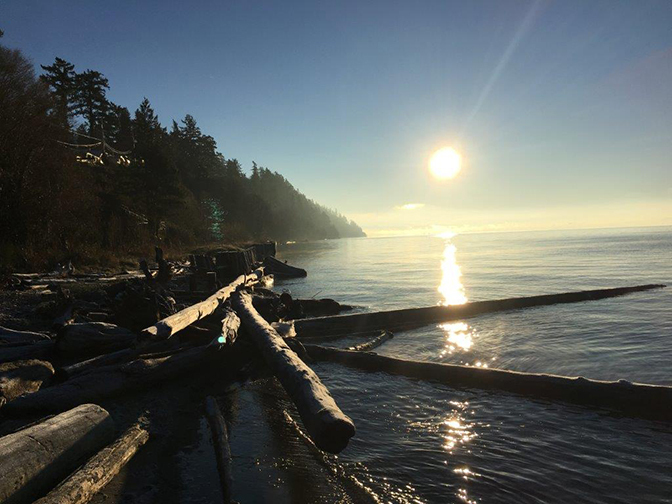 Similar to Tulalip Bay, the waters of the Salish Sea travel into the inlet of Whidbey Island, providing a scenic view for the citizens of Island County. This morning in particular was gorgeous. While the sun emerged into the sky, fog slowly ascended from the water that was now approaching the paved boardwalk of the park. This was the event the locals came to witness, a king tide. On the night of January 20, you may have caught a glimpse of the super blood wolf moon as the sun, earth and moon aligned perfectly. This rare lunar eclipse is also known as syzygy and causes a stronger gravitational pull and therefore, higher tides. At an estimated thirteen feet, the tide was highest at 8:28 a.m. in Oak Harbor that Friday morning. The long stretch of sand, rocks and driftwood that makes up the beach of Flintstone Park appeared to have vanished as large waves splashed against the coast. “King tide is not a scientific term, it simply means higher than our normal everyday tides,” explained Bridget Trosin, of Washington Sea Grant, to the crowd. “In this area, we get king tides usually in November, December, January and February. One of the situations where we get a king tide is at a perigee tide. Basically that is when we orbit the sun and as the moon passes in that close section we get higher than high tides. As the moon is hugging the earth in its orbit, it’s bulging out our ocean waters. Now that the Oak Harborites acquired both a better understanding as well as a live visual of a king tide, Bridget requested that each member of the group download an app to their phones called MyCoast. The purpose of the app is to measure king tides at local shores by using user submitted photos. She then stressed that king tides are an important occurrence and the need to monitor them is crucial because they give us a glimpse into the future of what normal, or perhaps even low tides, might look like in a few decades due to sea-level rise. Rising sea-level is a complex topic that will in time impact the entire planet. Many major cities across the world will experience severe flooding and in some extreme cases will be underwater completely. Because sea-level rise is so dynamic and there are several factors in play, it’s hard to determine exactly when specific areas will begin to see major impacts. However, the general consensus appears to be that sea-level will continue to rise at about its current rate until the middle of this century and then will actually accelerate at even a faster pace after that. So what causes sea-level rise exactly and why should you be concerned? Since the Industrial Revolution in the 1800’s, the Earth has been heating up due to the burning of fossil fuels and the production of greenhouse gases. As the planet traps those emissions in its atmosphere, the warmer Earth gets. And as a direct result of global warming, the amount of water in the ocean is increasing because as water heats, it expands. Another large contributing factor to sea-level rise is the melting ice caps and ice sheets happening in both Greenland and Antarctica. Shortly after the King Tides event in Oak Harbor, and we’re talking merely a few hours, reports from major news sources were released. Alerts from the New York Times, BBC News and CNN began to pop-up onto people’s smartphones claiming that Greenland’s ice caps are indeed melting at an even much faster pace than predicted by scientists, environmentalist and conservationists. The news was shocking to say the least and sent social media into a bit of a frenzy. The reports show ice caps in Greenland’s southwest region have been melting at least four times faster in the past decade than they have over previous centuries. Due to the combination of global warming paired with oscillation, a weather phenomenon that affects air temperature, Greenland’s ice caps are not only breaking off into large icebergs, which over time melts into the ocean, but are also beginning to thaw at the top of the glaciers which is causing ‘rivers’ of meltwater to pour into the ocean, and is subsequently melting more ice as it travels down the glaciers. Cities along the east coast of the United States will be the first to be affected and will see significant sea-level rise and are also now susceptible to more hurricanes. 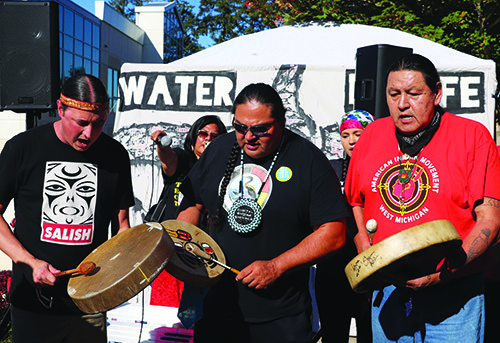 Northwest tribal nations have been anticipating a rise in water for at least a few generations now. 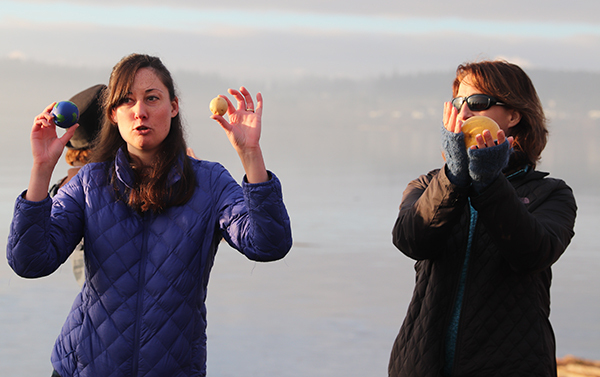 As coastal communities, Salish tribes are one the first to feel and witness the effects of sea-level rise. As you may recall, the Quinault tribe is currently in the early process of relocating both of their entire villages of Taholah and Queets because rising sea-level and high tides have already begun to flood the communities. As sea-level rises, it has the potential to change entire landscapes. In a report released in the summer of 2018, the Projected Sea Level Rise for Washington State, evidence shows that because of the Juan de Fuca tectonic plate, many Puget Sound communities are currently sinking while Neah Bay’s land is actually rising. In addition to inundation and landform change, another huge impact sea-level rise will have on tribal communities is habitat loss, reducing marshes, mudflats and intertidal habitats. Habitat loss can cause significant changes to the food chain and as Phillip explains, this happens due to the erosion of coastlines. “One thing we are studying in Tulalip is our outer coast,” he states. “Because as sea-level rises, a couple things will happen. One, the water will be at base more often and it’s the water at the base of the bluff that erodes the bluff more than anything else. But also because it will be higher than the storms that are coming in. When storms come in, you have the distance over open water that the winds are blowing, the greater the distance the bigger the waves. But also the deeper the water, the less those waves are dragging on the bottom of the ocean floor and losing energy. So the deeper the water is, those bigger waves will come further in and hit the bluff more often. So you end up with faster erosion. As it erodes faster, that means that all the material is coming down faster. Unfortunately, sea-level rise is inevitable. Yes, you read that correctly. In time, which is proving to be closer than we thought, all of the ice caps will melt and the world’s water to land ration will increase. How much it will increase and when is still yet to be determined but if the recent news of Greenland’s ice caps are any indication, scientists are predicting by the year 2100, cities around the globe can see anywhere from three to ten feet of sea-level rise. And although the east coast will probably see the effects on a larger scale, the entire west coast along the Cascadia subduction zone could be pushed back, making many current coastal cities uninhabitable. Researchers are hoping communities can look at these statistics and estimations to plan for relocation if need be and to prepare for a series of natural disasters such as extreme floods, storms and hurricanes that could result from sea-level rise. Please visit www.WAcoastalnetwork.com to view the most recent reports and projections of sea-level rise in Washington. And be sure to check out the National Oceanic and Atmospheric Administration Sea-Level Rise Viewer at www.coast.noaa.gov/slr/ to see how sea-level rise, of up to ten feet, can impact your communities, as well as for additional information. Indigenous women were at the forefront of Seattle’s Women’s March on January 21, 2017. Donald Trump is President. For many in the Pacific Northwest and throughout Indian Country that is a gut-wrenching fact that will take some time to fully process. But it is a fact of life and we must adapt to a changing political climate like we have always done. And that’s just it, we as Native people have always been fighting to protect our lands, water, treaty rights and future generations. There’s never been a pause to our fight, no one has ever said let’s take a break from resisting Western assimilation because of whoever happened to be in a local, state, or federal office. We honor our ancestors for their gifts of teachings to be strong, resilient and compassionate every day with every breath we take, just by being able to say we have endured and we are still here. Now, Donald Trump is President and seemingly by the hour we are getting updates as to how he plans on weakening our treaty rights and depleting our resources. 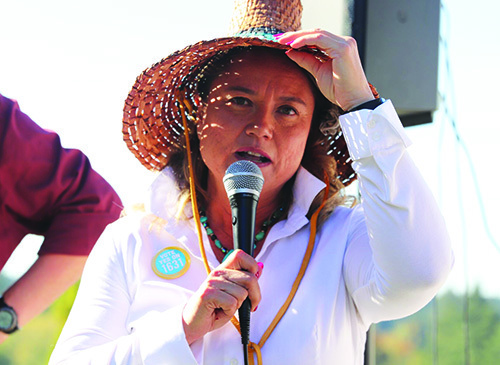 From signing executive orders to revive the Keystone XL and Dakota Access pipelines, to freezing Environmental Protection Agency grants and contracts, to potentially eliminating the Violence Against Women Act, there have been no shortages of offensive and egregious legislative actions being aimed at the tribes by the Trump Administration. However, none of this should come as any shock or surprise. It’s all been completely in line with who we know him to be and what we know him to stand for. If anything, it’s surprising to see a President follow through on several key promises he made during his campaign as quickly as Trump is. The moment Trump took office and became the 45th President, the White House website received a digital makeover to reflect the values and missions of the Trump Administration. As a result, White House policies on several high-stake issues were no longer available. One such issue was climate change, an issue that is critically important to the health of the world, but not so important to our President who routinely refers to climate change as “a hoax”. So we will continue to watch and listen carefully as Trump continues to follow through on promises he made on his campaign trail because he did make these promises, but many didn’t listen. Now he’s doing exactly what he promised to do and there are a lot of progressives, our so-called allies, who are complicit in the legislation for policies like the pipelines going forward. “I honestly believe that this monumental loss of faith in DC is a step in the right direction. No matter the President or who was Senator or Congressperson, DC has always been an obstacle, not an aid to our communities,” stated Native activist and renowned speaker Gyasi Ross via Facebook. “Our solutions are at home. Simple. That is shown by the fact that we have a home, a homeland – our communities were supposed to have been wiped out. Physically. Genocide. Extermination. But we weren’t wiped out and because of that we’re still able to improve, evolve and grow. Of course we can point to dysfunction, but that’s normal. That’s growing pains. We’re learning how to love ourselves again, to believe in ourselves again, to trust us and our own brilliance and spirituality. When we learn that fully, the solutions will be self-evident. 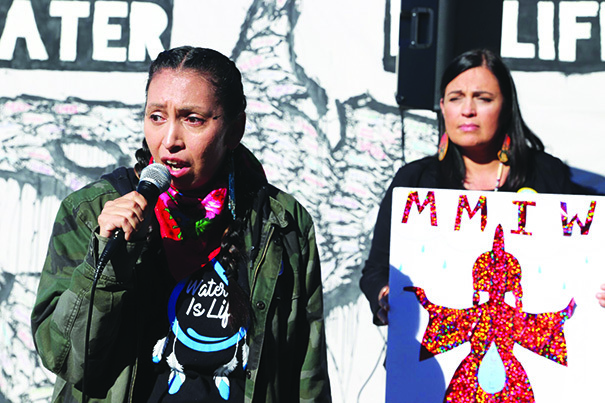 Indeed, there must be a transformation and necessary resistance to defend against the likes of the Trump Administration and all other levels of government and establishment that seek to exploit the Earth and weaken our treaty rights. 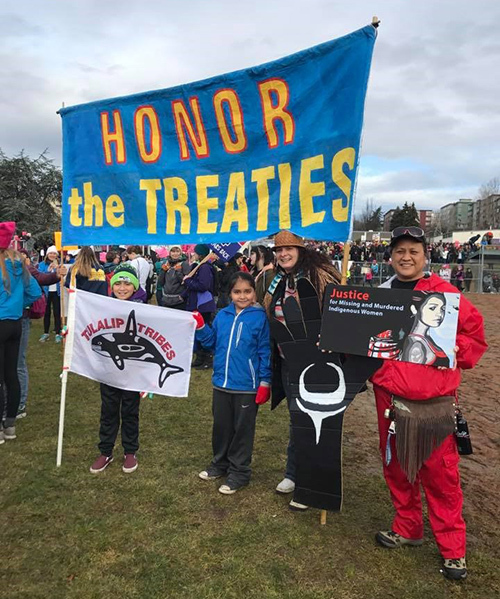 That resistance has been ongoing for the Tulalip Tribes because, again, organizations of all sorts have sought to lay claim to our lands, waters, and way of life long before Trump. 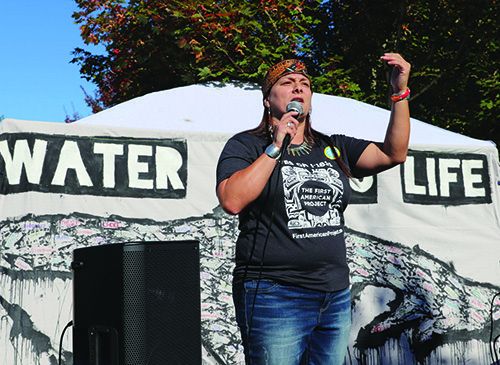 “The Tulalip Tribes has been legally fighting against any coal, oil, pipeline, or anything else that will ruin our Mother Earth and negatively impact our fresh water, our air quality, and our salt water,” says Theresa Sheldon, Tulalip Board of Director. “We will continue to oppose any policy or legislation that may make it easier for the federal government to exploit our lands and our way of life. Within minutes of Donald Trump’s swearing in as 45th president of the Unites States, the pages on climate change, previously found on whitehouse.org, went dark. They were replaced with the following on a page dedicated to an energy plan. Climate change isn’t happening to some of us. It’s happening to all of us, and it’s going to take all of us to meet its challenges. 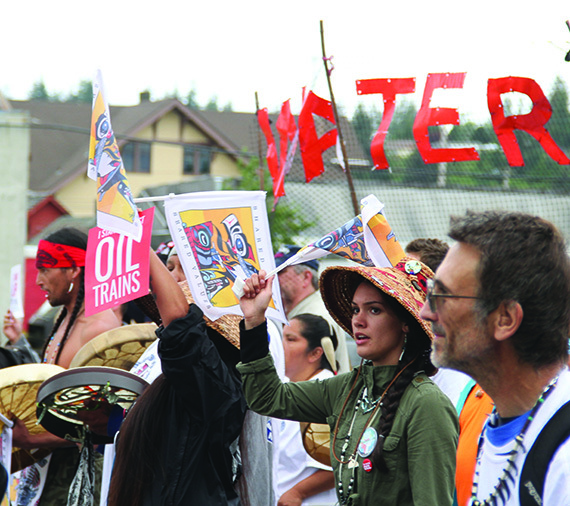 A recent report from the treaty Indian tribes in western Washington brings the issue of climate change home. Home to the ocean, beaches, rivers and forests that support our treaty-protected rights and resources. Tribes are closely connected to the natural world and we are seeing the increasing effects of climate change throughout the region: Higher air and water temperatures, disappearing glaciers, decreasing summer streamflows, rising sea levels and stronger winter storms. Climate change worsens factors that are already affecting our resources, such as the continued loss of salmon habitat faster than it can be restored. When we add projected population growth to the mix, the future looks grim. Climate change is the most significant environmental event of our lifetime. That’s why we want to focus attention and work together with local, state and federal governments and others to address its effects. We applaud the state of Washington for leading the nation by using the state Clean Air Act to establish a cap on carbon pollution that is the main cause of climate change. We think Gov. Inslee’s call for a carbon tax is a good idea. It could provide a big boost to clean energy, forest health and other solutions to address climate change. The tax would be levied on any company that generates or imports electricity, natural gas or oil, such as power plants and refineries. It would be the first of its kind in the nation, and would encourage other states to follow Washington’s lead. In the meantime, tribes are conducting vulnerability assessments and implementing adaptation plans to protect tribal communities and resources from the effects of climate change. Many of the actions needed in salmon recovery also reduce the effects of climate change. Stream buffers, functioning floodplains and adequate instream flows cool waters and protect water supplies. They help create resilience in salmon and other species by helping them adapt to climate change. 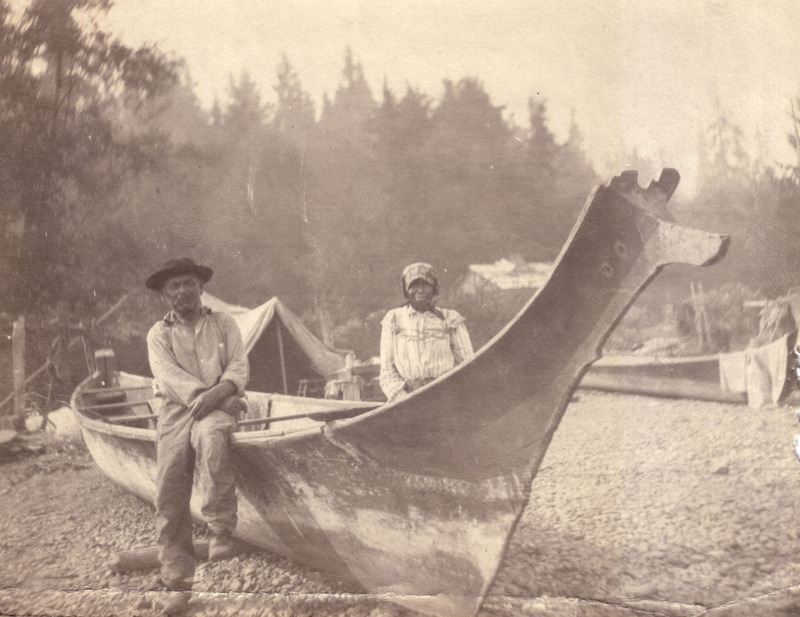 Tribes have always lived along the coast and in the watersheds of western Washington. We know these lands and waters better than anyone else. 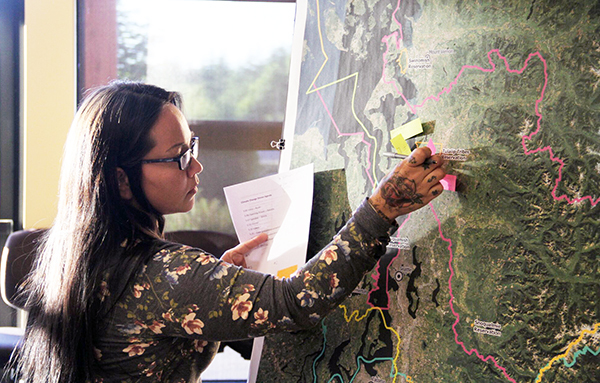 We are committed to sharing centuries of traditional knowledge combined with today’s science to help others identify, track and adapt to climate change trends across the region and throughout the world. To learn more about climate change, how it affects tribes, and what the tribes are doing about it, visit us on the web at nwtreatytribes.org/climatechange. Despite their unbreakable connection, salmon harvest and habitat restoration continue moving down separate roads in western Washington. Many people either don’t see or choose to ignore the fact that habitat determines harvest, and that we continue to lose habitat faster than it can be restored. Indian and non-Indian harvest has been cut to the bone this summer because of expected historically low returns, especially coho. Yet habitat loss and damage – the root of the problem – continues every day throughout our watersheds and nearshore marine waters. Poor ocean survival conditions certainly played a role in the low salmon returns of the past several years. But even when we can restore or protect salmon habitat, we aren’t helping ourselves enough. You might be surprised, but fish really do grow on trees. Trees keep water temperatures low, the way salmon like it. Their roots help to prevent soil erosion that can smother salmon eggs. When they fall into a river, trees provide diverse rearing habitat for fish. When the salmon spawn and die, their nutrients feed the trees. 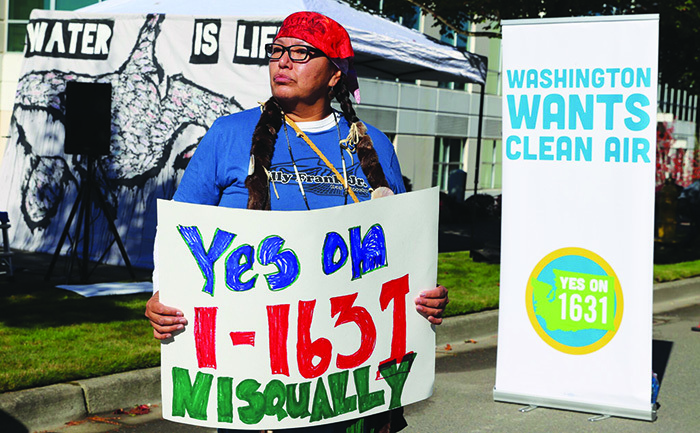 Yet from 2006 to 2011 we lost the equivalent of two Seattle-sized forests or about 170 square miles, according to the treaty tribes’ 2016 State of Our Watersheds Report. The report can be viewed at nwifc.org/sow. When we lose habitat, we also lose the natural production of salmon it provides. The collapse of our fisheries is simply mirroring the collapse of the eco-systems that support them. For more than 100 years, hatcheries have tried to make up for that loss, but hatchery salmon depend on the same declining habitat as naturally spawning salmon. 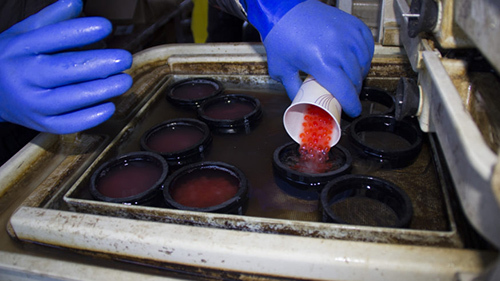 About half of the salmon harvested in western Washington are hatchery fish. 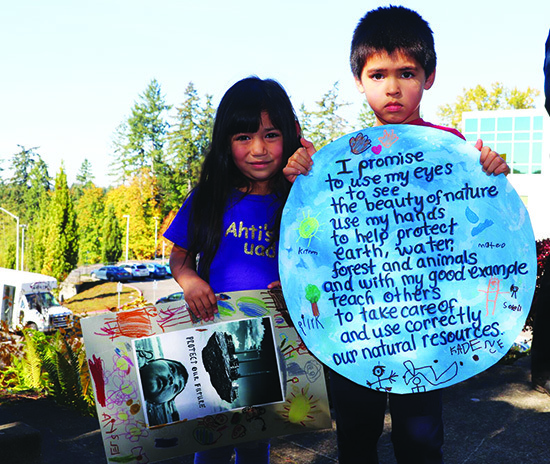 Continued habitat loss means we will have to depend on hatcheries for as long as lost and damaged habitat continues to restrict natural salmon production and threaten treaty rights. Hatcheries are simply a tool. Some provide fish for harvest while reducing harvest pressures on weak stocks. Others serve as nurseries to protect threatened salmon stocks. All are essential to salmon recovery and should be integrated in our salmon recovery efforts for every watershed. We need every tool in the box to reinforce remaining salmon populations as we work to restore habitat. The importance of this tool should be reflected in its funding, but as the need for hatchery fish has increased, state funding for hatcheries has declined or remained flat. Treaty tribes have stepped up to fill the gap in recent years and provide more salmon for everyone by picking up the costs at a number of state hatcheries where production was threatened by budget shortfalls. The connection between harvest and habitat is clear. We cannot expect to harvest salmon – either hatchery or naturally spawning – as long as we continue to destroy salmon habitat. In the meantime, hatcheries must continue to help bridge that gap and be included as the essential part of salmon recovery that they are. 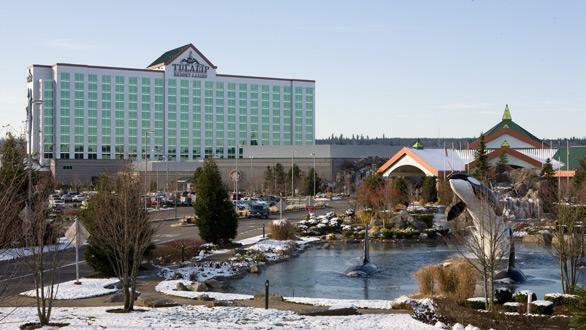 Nestled between Seattle and Vancouver, BC, the Tulalip Indian-owned Quil Ceda Village offers gaming, luxury accommodations, entertainment, shopping, fine dining and more. SEATTLE – Casinos operated by 22 Native Nations in Washington State generated millions of dollars in contributions to communities, non-profits, and smoking-cessation and problem-gambling programs in 2013 and 2014, according to a report by the Washington State Gambling Commission. 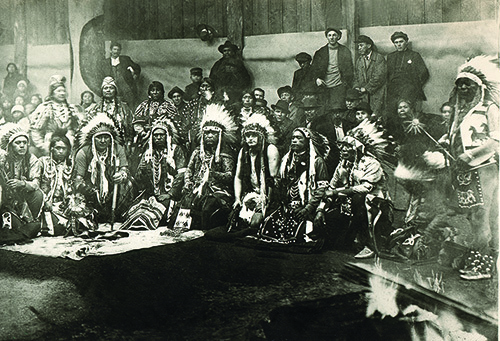 In accordance with compacts, or agreements, with the state, Native Nations contribute 0.5 percent of machine gaming net receipts to nonprofit and charitable organizations; up to 2 percent of table-game net receipts to governmental agencies; 0.13 percent of machine gaming net receipts to smoking-cessation programs; and 0.13 percent of Class III net receipts to problem-gambling programs. Staff members of the state commission presented “Tribal State Compact Tribal Contributions” to commissioners on Jan. 15. Commissioners and reporters had the opportunity that day to ride along with enforcement agents, watch gaming-machine compliance tests, and tour a forensics lab. The mission of the gambling commission is “Protect the Public by Ensuring that Gambling is Legal & Honest,” and Native Nations with casinos help in that mission through the compact and, in many cases, with their own gaming commissions. According to the report: Native Nations with casinos distributed nearly $6.5 million in community impact funds in 2013, and $6.6 million in 2012; contributed copy2.6 million in 2013 and copy1.8 million in 2012 to non-profits and charities; allocated $2.4 million in 2014 and $2.2 million in 2013 for smoking-cessation programs; and allocated $2.8 million in 2014 and $2.5 million in 2013 to help prevent and treat gambling addictions. 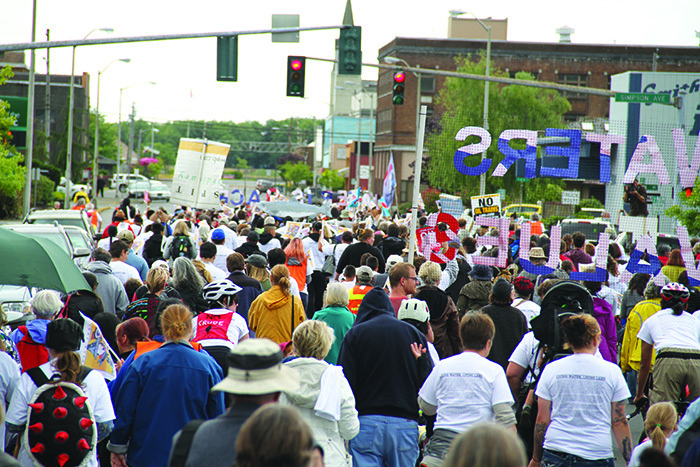 Community impact funds are invested in local law enforcement, public safety, and roads. Charitable funds benefit local food banks, disaster relief organizations, sports and recreation programs, United Way, veterans organizations, YMCA, YWCA, youth organizations, and others. Smoking-cessation and problem-gambling contributions help pay for the state Department of Health’s 1-800 Quit Line, community behavioral-health programs, and programs operated by local health care authorities. Contributions for 2015 were not available. For most if not all Native Nations that have casinos, gaming is only part of a larger economic development portfolio. 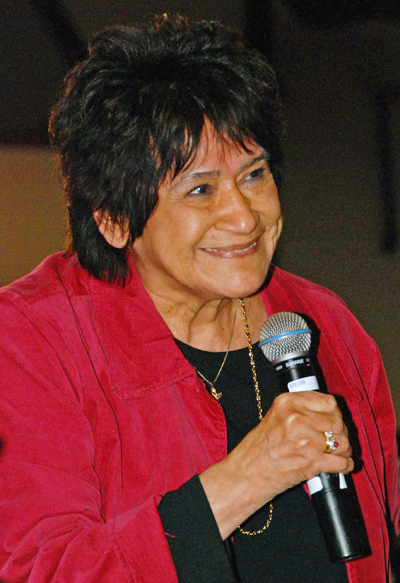 According to Julie Saw’Leit’Sa Johnson, Lummi, chairwoman of the Native American Caucus of the Washington State Democratic Party, Native Nations – or Tribes – are collectively the fourth-largest source of jobs in Washington state. The Quinault Nation, owner of the Quinault Beach Resort and Casino, as well as other ventures, is the largest employer in Grays Harbor County. The Suquamish Tribe’s Port Madison Enterprises, which manages the Suquamish Clearwater Casino Resort, White Horse Golf Club, and other ventures, is the second-largest private-sector employer in Kitsap County, west of Seattle. The Tulalip Tribes town of Quil Ceda Village, home of Tulalip Resort Casino, Tulalip Amphitheater, Seattle Premium Outlets, and other dining, entertainment and retail businesses, is the third-largest source of jobs in Snohomish County. Many casino-resorts have evolved beyond gaming and become convention, dining and entertainment destinations, as well as showcases for cultural art. 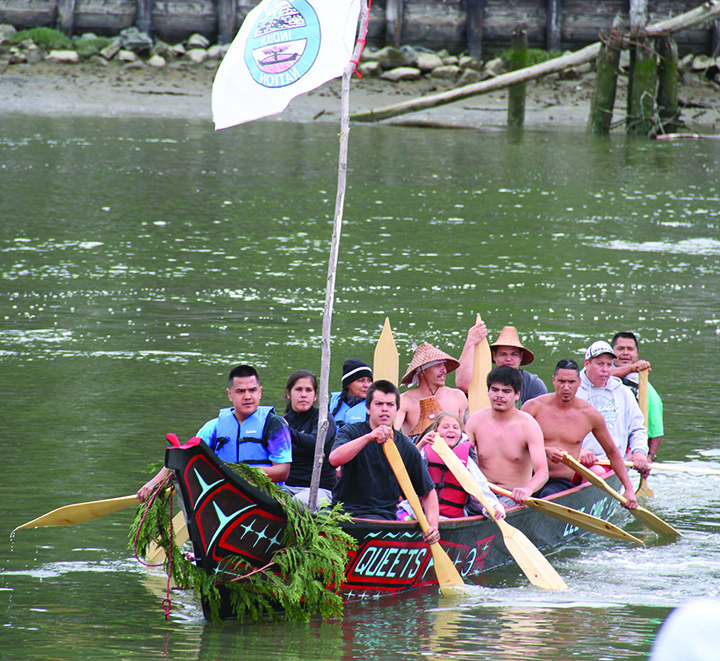 Guests at the Suquamish Clearwater Casino Resort Hotel can take a shuttle to the Suquamish Museum and other cultural sites. The new Yakama Nation Legends Casino Hotel is being built a half-mile from the Yakama Nation Museum & Cultural Center. 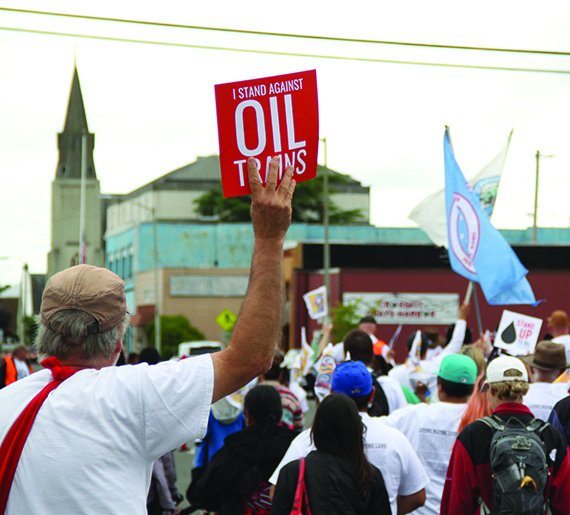 EVERETT — Oil train explosions might grab headlines, but there are a number of other issues surrounding the shipment of fossil fuels that are bringing a diverse group of local leaders together. SELA, the Safe Energy Leadership Alliance, is providing a forum for local leaders to work together to protect their communities from the negative effects of rising shipments of oil and coal. More than 150 public officials are listed as members, including mayors and city council members from many Pacific Northwest cities that lie on major rail lines, such as Edmonds, Mukilteo, Everett and Marysville. SELA’s latest meeting, the sixth since the group was established, included several tribal leaders, uniting native and non-native leaders around a common interest. “I think this is one of the first initiatives that brings us all together,” said Tulalip Tribes Chairman Mel Sheldon Jr., who attended the Feb. 4 meeting at Everett Community College. King County Executive Dow Constantine organized SELA a year and a half ago, and the group’s influence now extends into Oregon, Idaho, Montana and British Columbia. A regional organization is needed to counter the power that international oil, coal and railroad companies have, he said. “Local elected officials acting individually won’t be able to have an impact on the global or national issues,” Constantine said. And yet, local communities bear the effects of those same industries, whether it’s the risk of oil spills or fires, coal dust blowing out of passing hoppers, or even traffic jams in cities such a Marysville with a high number of at-grade crossings. 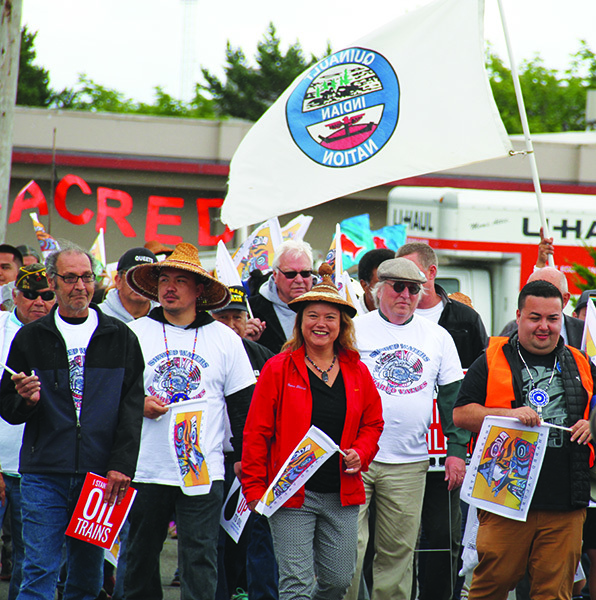 For Tim Ballew, chairman of the Lummi Nation, the issue hit home when SSA Marine applied to build the new Gateway Pacific coal terminal at Cherry Point, close to the Lummi Reservation. 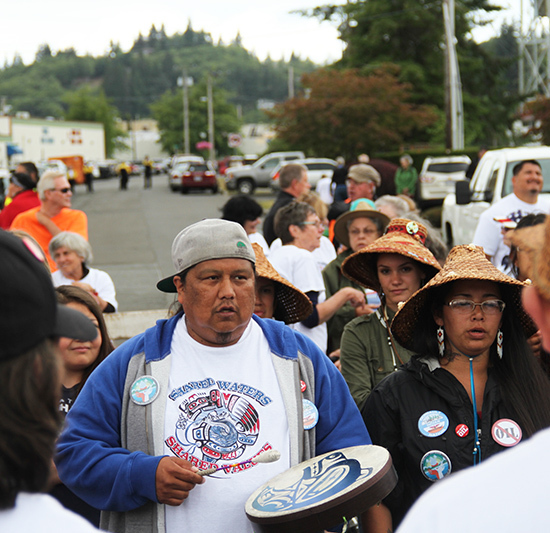 The Lummi were joined by several other tribes, including Tulalip and the Swinomish Indian Tribal Community, in opposing the project. Ballew told the SELA attendees that effects of increased shipping on native fishing grounds as well as the development of the terminal in an area of spiritual and archaeological significance present a challenge to the tribe’s treaty rights. “At the heart of the issue, with all of these negative impacts that will come to our community and compromise the integrity of the place we live in, the benefits won’t really go to the people,” Ballew said. The U.S. Army Corps of Engineers is expected to issue a ruling soon on the project’s permit. Keeping the focus on a single issue has allowed SELA to transcend partisan boundaries, too, Constantine said. Tribes seek to protect their treaty rights, cities fear derailments and traffic blockages, and rural communities find that fossil fuels are taking up more rail capacity and squeezing out agricultural products. One 2012 study by the Western Organization of Resource Councils predicted that rail traffic of wheat, corn and soybeans will have to compete with coal and oil for space on trains, resulting in longer delays in getting to market. There were 38.3 million tons of agricultural products shipped to Asia through Pacific Northwest terminals in 2010. “Farming and ranching and orchards are tough enough businesses without piling on the added burden of getting goods to market,” Constantine said. David Browneagle, vice chairman of the Spokane Tribe of Indians, pointed out that pollution ultimately doesn’t discriminate who it affects. He added his great-great grandfather tried and failed to prevent the railroads from arriving in Indian Country, but that it’s a good thing that this group was doing something now to push back. Megan Smith, director of Climate and Energy Initiatives in Constantine’s office, has been tracking progress and the public comment windows of new terminal projects in the northwest, as well as coordinating those comments from a large number of local officials. So far, SELA members have sponsored successful legislation in Olympia, in the form of tougher safety regulations on oil trains, as well as in Oregon, which has enacted a similar law, Smith said. The work won’t stop at Cherry Point or with a few state laws. Another proposal, the Tesoro Savage oil terminal in Vancouver, Washington, will enter the environmental review stage possibly by the end of the year, said Beth Doglio, the campaign director of the environmental nonprofit Climate Solutions. Tesoro Savage could become the largest terminal on the West Coast, Doglio said. The oil and coal boom is fueling interest in other projects all over the country. “We are definitely a movement together that has been very strong, very clear in the message that this is not what we want in the state of Washington, Oregon, Idaho, Montana, and North Dakota,” Doglio said. Tulalip Chairman Sheldon said SELA is helping different groups learn to work together and trust each other. That may lead to identifying other common interests. “When you get leaders coming together with good issues, issues that bond us together, that to me really is the formula for success,” he said.